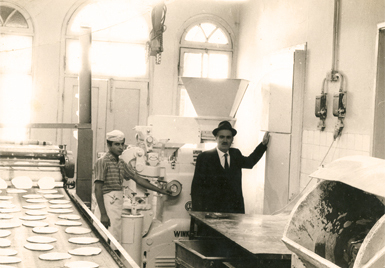 The Nina Family Story starts with Nasri Nehmeh, who founded Nina Bakery in Haifa-Palestine, back in 1936. Twice he had to build his pita bakery from scratch. He combined both his skills, as a baker and as a blacksmith, so in 1958 he patented his invention of a cyclical automatic oven. 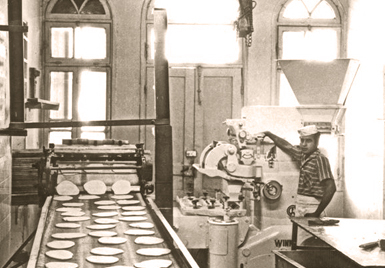 By the time it was 1964, Nasri had fully automated his production line. Nasri put his heart and soul into his business and nowadays, the 2nd generation Nehmehs, represented by his children, does the same. They follow their father’s mission to produce the best artisan pita on earth. The business, named after Nasri’s daughter Nina, is lead with the same passion as by the founder. Nina Bakery’s unique and varied choice in pita bread is the ideal choice for foodservice and retail throughout the world. After winning the local customers in Israel since 1936, Nina Bakery has gone global, with customers from the USA to Japan and throughout Europe. Nina Bakery’s growth goes steady and strong. In close cooperation with Nina Bakery Haifa, Marlies Wolters and her team run the European market, using her experience and passion in the marketing of flat bread in the European foodservice and retail market.The European cold store, based in the Netherlands, supplies the entire European market whilst the bakery in Haifa serves the local customers and the rest of the world.